Professor Malcolm Williams guides workshop participants through the interactive presentation. Saturday, January 28th brought sunny weather outside, brightening the inside of the downtown SFSU Extension Center classroom where a group of translators assembled to further develop their skills in the editing and revision of written documents. Professor Malcolm Williams, from the School of Translation and Interpretation at the University of Ottawa, presented his 6-step approach to the production of documents of deliverable quality, which he calls The 6 C’s of Quality Editing: Concision, Clarity, Coherence, Cohesion, Consistency, Correctness. The workshop consisted of activities that involved applying the 6 C’s to each of the stages of ESL editing. After discussing a specific topic, Professor Williams reviewed the concept by highlighting key aspects, then allotted time for participants to work on the practice activity, and concluded the topic by having the attendees discuss the practice activity as a group. The process of introducing, describing, giving examples, reviewing, practicing, and follow-up with questions and answers reinforced the learning process. According to the presenter, the 7-hour workshop, which began at 9 am and concluded at 5 pm with an hour-long lunch break, was a condensed version of a course that he developed and regularly teaches at the University of Ottawa. He also taught a 20-hour version of this topic in January as a guest lecturer at the Monterey Institute of International Studies (MIIS). Considering the MIIS tuition, those in attendance greatly benefited from Professor Williams’ depth of experience and knowledge of the subject at the much lower NCTA workshop fee. It was indeed a bright day for those present. From the outset, insights to editing were emphasized. For example, a translator should take stock of where to develop personally and professionally. Citing The Prosperous Translator by Chris Durban, Professor Williams pointed out that a successful translator must possess two main qualities: the ability to write well in the target language and proficiency in the subject field knowledge. Therefore, after this self-evalution, if a translator finds weaknesses in writing ability or specialization knowledge, it would behoove the translator to focus on overcoming those weaknesses. Of course, writing ability and knowledge are subjective, so honesty is key here. Williams added a third qualification to the list: a translator must also be able to be critical of their own work as well as those of others. Furthermore, an individual’s instinct has an impact on success. Relying upon one’s instinct is important, while at the same time, it is imperative to not rely blindly on instinct. Williams gave an example from his teaching at MIIS. 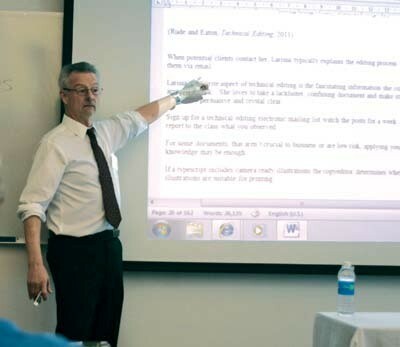 While reviewing the material on an aspect of the lecture, MIIS students corrected him. Apparently, the U.S. English word dependent (which is here correctly spelled) would be spelled dependant in U.K. English. Williams, an expert in his field, had he defended the U.K. spelling of the above-mentioned word, might have damaged his reputation if he had given short shrift to the MIIS students, who were in fact correct. mimi posted this article under Continuing Ed. on Tuesday, May 1st, 2012 at 12:06 pm	You can follow any responses to this entry through the RSS 2.0 feed. Both comments and pings are currently closed. Next Article → A CAT IN A SACK (I.E. A PIG IN A POKE)?